The Craft Barn have a new Alpha/ Dictionary challenge running and as I had so much fun joining the last one which was 2013........where did that time go........I was amazed! Anyway to say I was excited to start a new journey with this challenge is an understatement really love to play with stamps and inks and this is why I have chosen to do Art Journaling Pages, with the dictionary meaning for each word added to the pages |(one of the rules). All the details are on their blog follow the link above. the letter chosen for this first challenge is "B". My chosen AJ is watercolour paper pad and I have strengthened the perforated edge with tissue tape to ensure the pages stay put. I will decorate the front cover along the way. 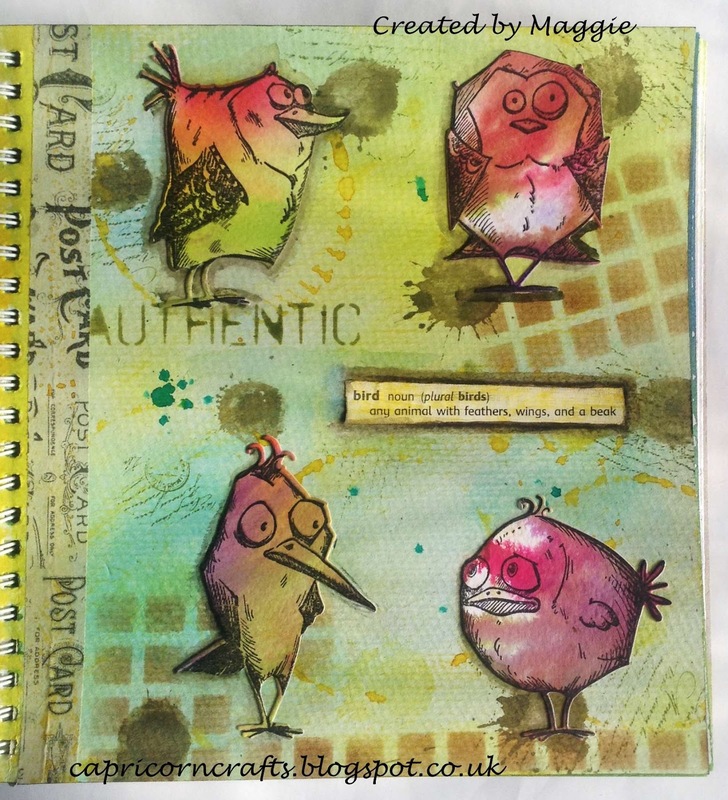 I have used the Crazy Birds stamps and dies for this my first page.......they were a Birthday present last week and I just had to use them for the first time, I love their quirky characters, they were stamped in versafine on a background created with water colour paper using aquatints inks. The page background was created firstly with gelatos which I have not used before...they were a free gift with a magazine. I was amazed at the colour they hold, I scribbled them over the page and created a wash with water, will be using these again I'm sure. My next step was to take anything that was on my desk for adding layers........distress inks through stencil, splatters of distress stains, text stamp Tim Holtz, and a lid dipped into Aquatints Ink. After much enjoyment the time was to stop........I do find this step hard to do ......lol. Lastly stick Crazy Birds on their perches. Dictionary definition was cut from dictionary. Hope to see crafters from challenge 2013 along the way. The Link to my 2013 Alpha challenge is here where you can see my altered dictionary pages. I've resisted the temptation to dive into Tim's crazy birds but my resolve is weakening... I love the background you have created for your bright birds. It is fun to see so many virtual friends taking part in the new challenge. I was a bit stunned that the last dictionary challenge was 2013 as well. Good to see you back again. Great first page and how could you not use your new Crazy Birds!! I'm still resisting the crazy birds, but it is difficult. Thanks for sharing it with Addicted To Stamps & More! Lovely page with the crazy birds, looks awesome, so glad to see you at ATSM. A great page Maggie. I so love those Bird Crazy stamps and the letter B is an excellent excuse to use them. I like the tissue tape idea too. Great color and the background is wonderful. Hahaha those crazy birds. Thanks for playing our challenge at One Crazy Stamper. I would have been here sooner, but I was out of touch with the internet for four days. The worst four days of my life (grin). This is an awesome first entry for the Craft Barn challenge. I see you have been bitten by the crazy birds, too. They are showing up all over the place, and I can see why everyone likes them. You colored them so well. Although I missed this challenge in 2013, I was glad to see you here, since I remembered your awesome art from the quotes/lyrics challenge two years ago. It is great to see your art again and enjoy how you interpret the challenge. Love your page, I used one of Tim's birds as well. You have reminded me that I too have unused Gelatos. I so want that stamp set of the crazy birds.Lovely page. A lovely page for B. The birds are really fun and so look like they've been up to mischief! Good to see you back and a great page for the start for the 2016 Craft Barn challenge. I love the Crazy Birds, they always bring a smile but I've resisted buying them.........so far! Love your colourful Crazies and how they pop against the background - that's an excellent birthday present!